Praise for Where Does Money Come From? “Refreshing and clear. The way monetary economics and banking is taught in many – maybe most - universities is very misleading and what this book does is help people explain how the mechanics of the system work”. 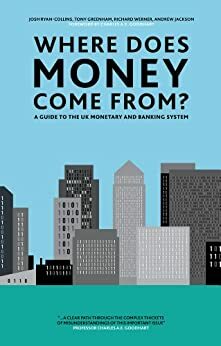 “It is amazing that more than a century after Hartley Withers’s The Meaning of Money and 80 years after Keynes’s Treatise on Money, the fundamentals of how banks create money still need to be explained. Yet there plainly is such a need, and this book meets that need, with clear exposition and expert marshalling of the relevant facts. Warmly recommended to the simply curious, the socially concerned, students and those who believe themselves experts, alike. Everyone can learn from it“. Victoria Chick, Emeritus Professor of Economics, University College London. 5.0 out of 5 starsGreat overview of the Monetary system. Not so much on the foundations of the monetary system but a good overview of how it operates.